More heart rocks? Here and here. 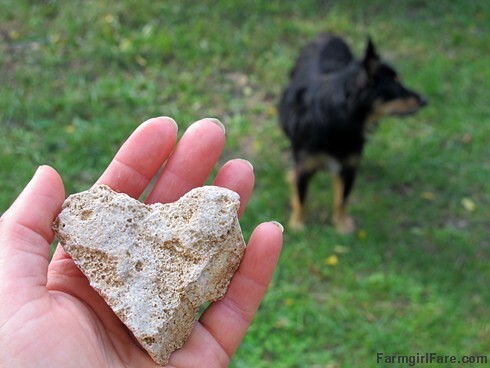 © FarmgirlFare.com, where I still keep finding heart rocks, and the love still keeps on pumping. How amazing. It's as if the love you bear for Joe, the menagerie and the farm somehow flows into the very ground you walk and coalesces into these wonderful stone tributes. I also collect heart rocks - years ago, right before my late husband was buried I tucked a small one into the breast pocket of his suit so he could carry my love with him into Eternity, and I have another on the small memorial I have to him in my bedroom. Thanks, Susan - hope you are feeling fine now. You could post only photos of your heart rocks and I would be a happy camper. I love them and am constantly amazed at how many you find. Hope you don't take this the wrong way: Are you sure your Hunky Farm Guy isn't carving some of those rocks and leaving them strewn about? I do miss so much your weekly Farm Fix :( Please do not abandon it. I look forward to it every week.